Dementiestoel (Alzheimer Chair) is a visual representation of Alzheimer, translated into a chair. The chair misses a piece of vital information to function correctly, in this case a leg. It tries to cope (and initially deny) this loss, by fabricating alternate structures. 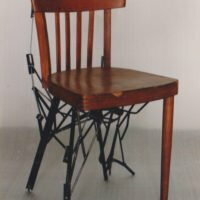 Although the chair might think that his problem is now no longer visible to the outside world (and therefore fixed), it is clear to all healthy chairs that the new structure does not resemble the missing leg.